Lions and Tigers and Walruses, Oh my! Do you ever have the feeling that you are being watched when you stroll through downtown streets? You are probably right. Hundreds of eyes peer out from buildings tracking your actions. These observers are neither human nor electronic. Instead, a host of animals watches you. A tour of any urban core reveals a veritable Noah’s Ark’s worth of carved and molded animals stalking your every step. Since I live in Seattle, I will share some of the beasts gracing our buildings. The Times Square building (414 Stewart) is a good place to begin a downtown wildlife safari. Built in 1916, during the height of popularity for endowing buildings with animals, the wedge shaped structure sports 61 lion’s heads and 18 eagles. You might not notice them at first glance since none are lower than the fifth story. Keep in mind that this high elevation placement of wildlife typifies many structures. Because of their symbolism as powerful, victorious, and noble animals, lions and eagles dominate the architectural menagerie. Six massive eagles stare out from the uppermost corners of the Washington Athletic Club and another half dozen with their wings outspread grace the Eagles Auditorium. If you look carefully, you can find more lions in Seattle than on the plains of Nigeria. Sixty feline heads loom out of the Seaboard Building (Fourth and Pike) while a parking garage at 1915 Second Avenue has a lion in profile. You can even see lions toting fruit at 1221 Second Avenue and find a zoological conundrum with a pride of lion reigning 14 stories up on the Alaska Building (Second and Cherry), which was Seattle’s first steel-framed skyscraper. 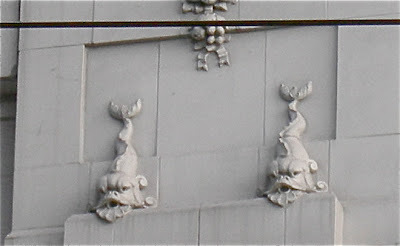 Animal ornamentation peaked between 1890 and 1940 in the heyday of terra cotta cladding in Seattle. Following Seattle’s Great Fire of 1889, architects turned to terra cotta as a cheap, light-weight, fireproof medium. In addition, because terra cotta was a molded clay block or brick, animals could be mass produced easily. Only four companies dominated the local industry and many downtown beasts probably originated from the same mold. 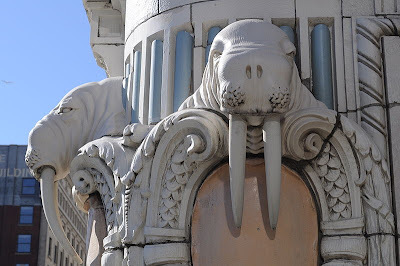 And, of course, the best known of these motifs is found at Third and Cherry, where a phalanx of walrus heads decorate the Arctic Building, built in 1916 by Seattle’s first round of instantly rich folk to provide a suitable locale to banter about tales of the north. (I have been told that the original walrus heads displayed ivory tusks and that city officials removed them after the 1949 earthquake when one fell. I have never been able to verify this and hoped that in sharing this story someone might reply with additional information.) The tusks were remodeled after that quake. The most recent renovation, in 1997, returned the walruses to their original splendor, with terra cotta tusks. Other animals found downtown include a metal bison, wolf, and bighorn sheep on planters at the base of the west side of what was the WaMu tower. Two goats and one cougar, as well as a pair of sheep and lions watch you enter the old Federal Building. Priteca also decorated the Coliseum Theater (Fifth and Pine) with 47 bull heads, festooned in bucolic splendor with pomegranates and grapes. The old Chamber of Commerce building (215 Columbia St.), constructed in 1924, houses Seattle’s most diverse collection of real and mythical beasts. Two pelicans, a duck, and the ubiquitous eagle along with a gazelle, deer, bears, dolphins, and rams share space with two griffins and two hippocamps, a mythical beast with the forelegs of a horse and the tail of a dolphin. Poseidon and his wife supposedly rode these sea horses. In regard to the griffins, supposedly back in the day, a few folks called Seattle the Venice of America. Why anybody thought that, I haven’t a clue, but griffins are the symbol of Venice. This structure was one of the final Seattle buildings elaborately embellished with wildlife. By the late 1930s, Modernism’s stark, brutish, unornamented surfaces had replaced the ornate style of terra cotta. Now, animals on Seattle buildings are only found in relict preserves. Happy hunting, no matter where you live. Next Next post: The Duomo and the Dinosaur: Not?